Sign up and receive Property Email Alerts of Houses for sale in Cedar Lakes, Johannesburg. Not to be missed, this sunny and bright single storey family home is situated in the Village and offers a very tranquil, pleasant and very secure living environment in one of the most family orientated estates in the country. The main living area is open-plan, very spacious and has high ceilings. 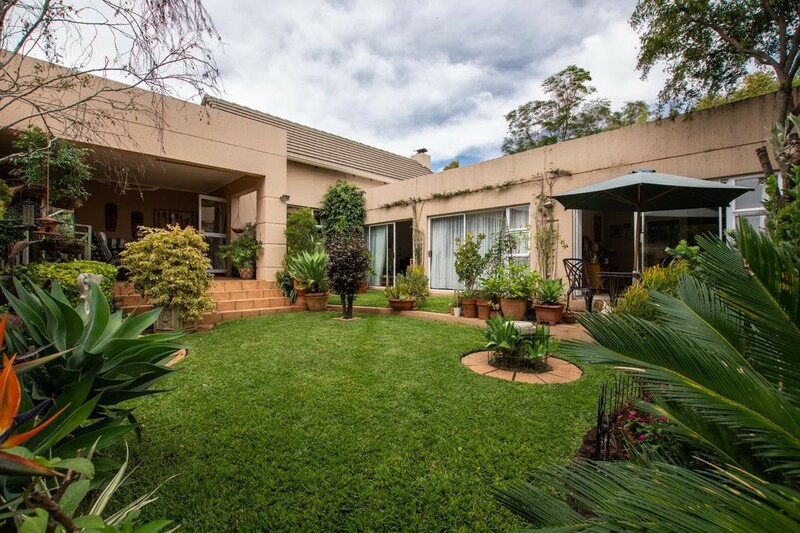 The dining area lead onto a delightful wooden patio with koi pond and the living room opens onto a large covered patio with built-in braai overlooking an exquisite garden that lead out to a beautiful grassed greenbelt. The kitchen is extra large, has plenty of cupboard space, incorporates the scullery and can accommodate 3 under counter appliances. The 3 bedrooms are a good size and all have aluminium sliding doors that lead out to the garden, and there are 2 bathrooms with the main bathroom en-suite. There is also a small office/study and auto double garage. Cedar Lakes is a considered one of the most sought after estate in the Fourways area, with extended greenery, nine lakes, walking paths and a wealth in bird life. It is offers a unique family lifestyle for young and old with two tennis courts, a double sized swimming pool with deck chairs and umbrellas, a water park a football field, a play area for the kids, multiple braai and picnic spots, fishing spots and a full on restaurant with live music on Saturday and a happy vibe. You won't find better. It is well positioned close to some top schools, bustling malls and 15 min away from Lanseria Airport. Sign-up and receive Property Email Alerts of Houses for sale in Cedar Lakes, Johannesburg.